It's time for you to experience the class that you deserve with this Phaeton Class A diesel motorhome. With this coach you will receive exceptional amenities, like the huge bathroom that contains a radius shower and large closet, as well as the master suite that contains a slide-out bed and flat panel TV. If you enjoy gathering together as a family, the central living area will be the perfect spot to do so with all of the ultraleather seating it provides on the two opposing slides. 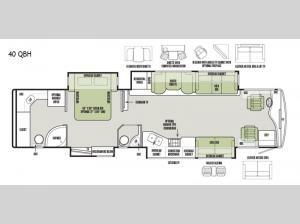 Pamper yourself with an extraordinary level of comfort in the Tiffin Phaeton motorhome. The Phaeton is a tourist attraction on wheels with its premium paint system that features full-body paint sealed with superclear ultraviolet protection and scratch-resistant plastic coating. The Phaeton is also known as a favorite brand among motorhome owners because of features like the 7' ceilings, three or four slides, and length options up to 45'. You can rest assured that in any Phaeton you'll find quality everywhere, even in the details, and you'll enjoy the smart refinements that enhance comfort and convenience throughout the coach, like the home theater sound system and central vacuum cleaner.